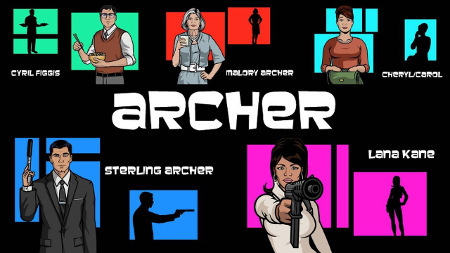 Archer is adult animated action adventure comedy television series that premiered on FX network in 2010. Until 2015. there is 75 brilliant episodes. Creator Adam Reed brought us pure genius in this one. Responsible for this review is fact that beginning April of 2016 we will get to watch long anticipated seventh season of this unique series. Characters you will come to know and love here work for ISIS or International Secret Intelligence service. Everything, from drawing to humor and lines is just perfect. Technology, political and global setting is ever changing and whole series is comically anachonistic. We follow our main protagonist Sterling Archer a profoundly self-centered master spy who deals with global espionage, his domineering, emotionally-distant mother and boss, Malory Archer, the mother of his child (and fellow ISIS operative), Lana Kane and his other ISIS co-workers (including fellow operative Ray Gillette, accountant Cyril Figgis, Human Resources Director Pam Poovey, dimwitted secretary Cheryl Tunt, and Applied Research head Doctor Krieger) as well as a code name Duchess (after his mothers deceased Afghan Hound). Every episode takes several months to develop and this shows. I can not recommend this one any higher. In honor of season seven I will produce some more reviews of animated fun content like The Simpsons, South Park or Futurama. Alas overall i think these are nothing like Archer i had fun watching them all. Great job on to all voice overs H. Jon Benjamin, Judy Greer, Amber Nash, Chris Parnell, Aisha Tyler, Lucky Yates, Jessica Walter. Also producer and creator Adam Reed, Matt Thompson and Casey Willis, Neil Holman, Eric Sims, Brian Fordney and whole FX Productions team, good job everyone. Solve this complex math: 10 + 7 = ?